Free High Resolution Art and Images of the Annunciation to the Virgin Mary with Study of the Art and Artists. Royalty free images of the great masters and their Biblical paintings are all here, everything you are looking for and its all free. Luke 1:26 begins the account of the life of the Virgin Mary with the Annunciation and ends in Chapter 24 with the apostles disbelief at Mary having seen the risen Lord, comprising all those scriptural incidents which connect her history with that of her Divine Son. But the great painters did not confine themselves to the scenes narrated in the Gospels. Not only were the simple Scripture histories colored throughout by the predominant and enthusiastic veneration paid to the Virgin�till the life of Christ was absolutely merged in that of his mother, and its various incidents became ' the seven joys and the seven sorrows of Mary'�but we find the artistic representations of her life curiously embroidered and variegated by the introduction of traditional and apocryphal circumstances, in most cases sanctioned by the Church authorities of the time. the winged spirit fresh from paradise ; the woman not less pure, and even more highly blessed�the chosen vessel of redemption, and the personification of all female loveliness, all female excellence, all wisdom, and all purity. We find the Annunciation, like many other scriptural incidents, treated in two ways�as a mystery, and as an event. Taken in the former sense, it became the expressive symbol of a momentous article of faith, the Incarnation of the Deify. Taken in the latter sense, it represented the announcement of Salvation to mankind through the direct interposition of miraculous power. In one sense or the other, it enters into every scheme of ecclesiastical decoration; but chiefly it is set before us as a great and awe-inspiring mystery, of which the two figures of Gabriel, the angel-messenger, and Mary the 'highly favored,' placed in relation to each other, became the universally accepted symbol, rather than the representation. THE ANNUNCIATION AS A MYSTERY. Considering the importance given to the Annunciation in its mystical sense, it is strange that we do not find it among the very ancient symbolical subjects adopted in the first ages of Christian Art. It is first seen as a mystical treatment in the eleventh century, when it appears in the Gothic sculpture and stained glass. In the thirteenth, and thenceforward, the Annunciation appears before us as the expression in form of a theological dogma, everywhere conspicuous. It became a primal element in every combination of sacred representations�the corner-stone, as it were, of every architectural system of religious decoration. It formed a part of every altarpiece, either in sculpture or painting. Sometimes the Virgin stands on one side of the altar, the angel on the other, carved in marble or alabaster, or of wood richly painted and gilt; or even of solid silver. Not seldom, we find the two figures placed in niches against the pillars, or on pedestals at the entrance of the choir. It was not necessary, when thus symbolically treated, to place the two figures in proximity to signify their relation to each other; they are often divided by the whole breadth of the chancel. Whatever the subject of the altarpiece�whether the Nativity, or the enthroned Madonna, or the Coronation, or the Crucifixion, or the Last Supper�the Annunciation almost invariably formed part of the decoration, inserted either into the spandrils of the arches above, or in the predella below; or, which is very common, painted or carved on the doors of a tabernacle or triptychon. If the figures are full length, a certain symmetry being required, they are either both standing or both kneeling ; it is only in later times that the Virgin sits and the angel kneels. When disposed in circles or semicircles, they are often merely busts, or half-length figures, separated perhaps by a framework of tracery, or set on each side of the principal subject, whatever that may be. Hence it is that we so often find in galleries and collections, pictures of the Annunciation in two separate parts, the angel in one frame, the Virgin in another; and perhaps the two pictures, thus disunited, may have found their way into different countries and different collections� the Virgin being in Italy, and the angel in England. Sometimes the Annunciation�still as a mystical subject�forms an altarpiece of itself. In many Roman Catholic churches there is a chapel or an altar dedicated expressly to the mystery of the Annunciation, the subject forming of course the principal decoration. At Florence there is a church�one of the most splendid and interesting of its many beautiful edifices�dedicated to the Annunciation, or rather to the Virgin in her especial character and dignity as the Instrument of the Incarnation. 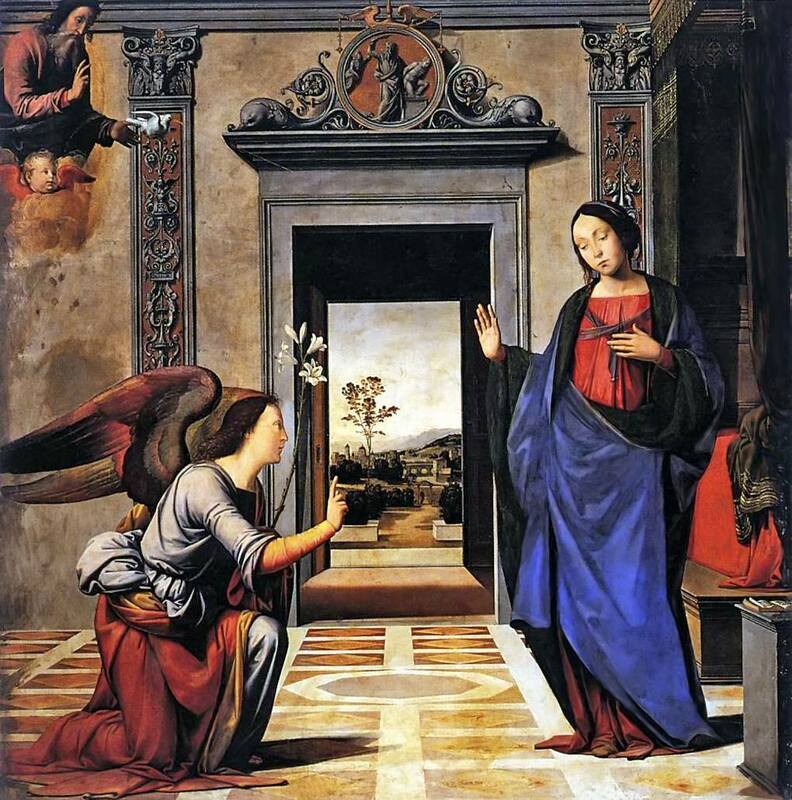 Here, in the first chapel on the left, as we enter, is to be found the miraculous picture of the Annunciation, formerly held in such veneration, not merely by all Florence, but all Christendom : found, but not seen�for it is still concealed from profane eyes, and exhibited to the devout only on great occasions. The name of the painter is disputed; but according to tradition, it is the work of a certain Fra Bartolomeo; who while he sat meditating on the various excellences and perfections of Mary, and most especially on her divine beauty, and thinking, with humility, how inadequate were his own powers to represent her worthily, fell asleep; and on awaking found the head of the Virgin had been wondrously completed, either by the hand of an angel, or by that of St. Luke, who had descended from heaven on purpose. It is evident that the Annunciation, as a mystery, admits of a style of treatment which would not be allowable in the representation of an event. In the former case, the artist is emancipated from all considerations of locality or circumstance. Whether the background be of gold, or of blue, or star-bespangled sky�a mere curtain, or a temple of gorgeous architecture; whether the accessories be the most simple or the most elaborate, the most real or the most ideal; all this is of little moment, and might be left to the imagination of the artist, or might be modified according to the conditions imposed by the purpose of the representation and the material employed, so long as the chief object is fulfilled�the significant expression of an abstract dogma, appealing to the faith, not to the senses or the understanding, of the observer. To this class, then, belong all those church images and pictures of the Annunciation, either confined to the two personages, with just sufficient of attitude and expression to place them in relation to each other, or with such accompaniments as served to carry out the mystical idea, still keeping it as far as possible removed from the region of earthly possibilities. 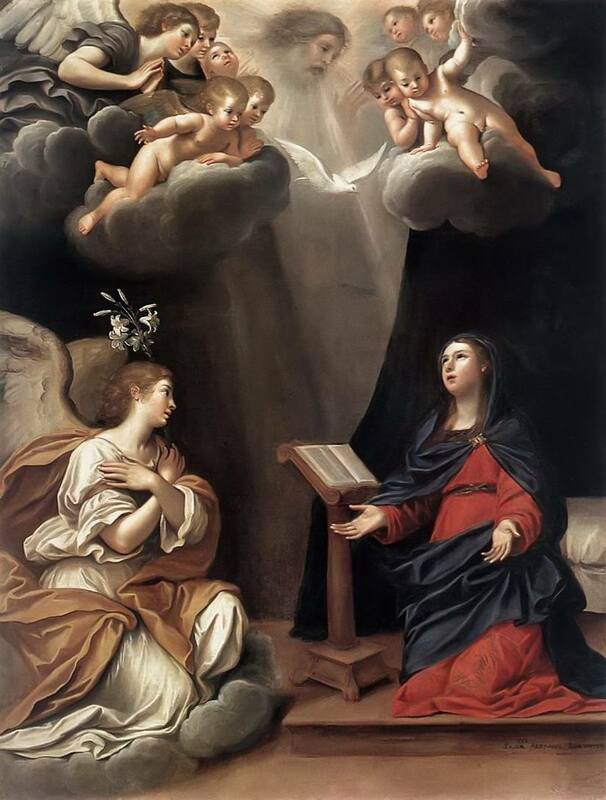 Very common in Italian Art is a less fantastic, but still wholly poetical version of the Annunciation, representing, in fact, not the Annunciation, but the Incarnation. Thus in a picture by Giovanni Sanzio (the father of Raphael), Mary stands under a splendid portico; she appears as if just risen from her seat; her hands are meekly folded over her bosom; her head declined. The angel kneels outside the portico, holding forth his lily; while above, in the heavens, the Padre Eterno sends forth the Redeemer, who, in form of the infant Christ bearing his cross, floats downwards towards the earth, preceded by the mystic Dove. This manner of representing the Incarnation is strongly disapproved of by the Abbe Mery, as not only an error, but a heresy; yet it was frequently repeated in the sixteenth century. The Annunciation is also a mystery when certain emblems are introduced conveying a certain signification ; as when Mary is seated on a throne, wearing a radiant crown of mingled gems and flowers, and receives the message of the angel with all the majesty that could be expressed by the painter; or is seated in a garden enclosed by a hedge of roses (the Hortus clausus or conclusus of the Canticles) : or where the angel holds in his hands the sealed hook, as in the famous altarpiece at Cologne. In a picture by Simone Memmi (Uffizi, Florence), the Virgin seated on a Gothic throne receives, as the higher and superior being, yet with a shrinking timidity, the salutation of the angel, who comes as the messenger of peace, olive-crowned, and bearing a branch of olive in his hand. This poetical version is very characteristic of the early Siena School, in which we often find a certain fanciful and original way of treating well-known subjects. Taddeo Bartolo, another Sienese, and Martin Schoen, the most poetical of the early Germans, also adopted the olive-symbol; and we find it also in the tabernacle of King Rene, already described. The treatment is clearly devotional and ideal where attendant saints and votaries stand or kneel around, contemplating with devout gratitude or ecstatic wonder the divine mystery. Thus, in a remarkable and most beautiful picture by Fra Bartolomeo, the Virgin is seated on her throne; the angel descends from on high bearing his lily; around the throne attend St. John the Baptist and St. Francis, St. Jerome, St. Paul, and St. Margaret. Again, in a very beautiful picture by Francia (in the Bologna Gallery), Mary stands in the midst of an open landscape ; her hands, folded over each other, press to her bosom a book closed and clasped: St. Jerome stands on the right, John the Baptist on the left; both look up with a devout expression to the angel descending from above. In both these examples Mary is very nobly and expressively represented as the chosen and predestined vehicle of human redemption. It is not here the Annunciation, but the "Sacratissima Annunziata" we see before us. In a curious picture by Francesco da Cotignola, Mary stands on a sculptured pedestal, in the midst of an architectural decoration of many-colored marbles, most elaborately painted; through an opening is seen a distant landscape, and the blue sky; on her right stands St. John the Baptist, pointing upwards; on her left St. Francis, adoring; the votary kneels in front. Votive pictures of the Annunciation were frequently expressive offerings from those who desired, or those who had received, the blessing of an heir; and this I take to be an instance. In the following example the picture is votive in another sense, and altogether poetical. The Virgin Mary receives the message of the angel, as usual; but before her, at a little distance, kneels the Cardinal Torrecremata, who presents three young girls, also kneeling, to one of whom the Virgin gives a purse of money. This curious and beautiful picture becomes intelligible, when we find that it was painted for a charitable community, instituted by Torrecremata, for educating and endowing poor orphan girls, and styled the "Confraternita dell Annunziata." In this charming Annunciation by Angelico, the scene is in the cloister of his own convent of St. Mark. A Dominican (St. Peter Martyr) stands in the background with hands folded in prayer. I might add many beautiful examples from Fra Bartolomeo, and in sculpture from Benedetto Mniano, Luca della Robbia, and others, but have said enough to enable the observer to judge of the intention of the artist. The Annunciation by Sansovino, among the bas-reliefs which cover the chapel at Loretto, is of great elegance. I must, however, notice one more picture. Of six Annunciations painted by Rubens, five represent the event; the sixth is one of his magnificent and most palpable allegories, all glowing with life and reality. Here Mary kneels on the summit of a flight of steps; a dove, encompassed by cherubim, hovers over her head. Before her kneels the celestial messenger; behind him Moses and Aaron, with David and other patriarchal ancestors of Christ. In the clouds above is seen the heavenly Father; on his right are two female figures, Peace and Reconciliation; on his left, angels bear the ark of the covenant. In the lower part of the picture, stand Isaiah and Jeremiah, with four sibyls :�thus connecting the prophecies of the Old Testament, and the promises made to the Gentile nations through the sibyls, with the fulfillment of both in the message from on high. THE ANNUNCIATION AS AN EVENT. Had the Annunciation to Mary been merely mentioned as an awful and incomprehensible vision, it would have been better to have adhered to the mystical style of treatment, or left it alone altogether; but the Scripture history, by giving the whole narration as a simple fact, a real event, left it free for representation as such; and, as such, the fancy of the artist was to be controlled and limited only by the words of Scripture, as commonly understood and interpreted, and by those proprieties of time, place, and circumstance, which would be required in the representation of any other historical incident or action. 'When all the accompaniments show that nothing more was in the mind of the artist than the aim to exhibit an incident in the life of the Virgin, or an introduction to that of our Lord, the representation is no longer mystical and devotional, but historical. The story was to be told with all the fidelity, or at least all the likelihood, that was possible ; and it is clear that, in this case, the subject admitted, and even required, a more dramatic treatment, with such accessories and accompaniments as might bring the scene within the sphere of the actual. In this sense it is not to be mistaken. Although the action is of itself so very simple, and the actors confined to two persons, it is astonishing to note the infinite variations of which this favorite theme has been found susceptible. Whether all these be equally appropriate and laudable, is quite another question; and in how far the painters have truly interpreted the Scriptural narration, is now to be considered. And first with regard to the time, which is not especially mentioned. It was presumed by the Fathers and early commentators on Scripture, that the Annunciation must have taken place in early springtime, at eventide, soon after sunset, the hot1r since consecrated as the ' Ave Maria,' as the bell which announces it is called the 'Angelus;' but other authorities say that it was rather at midnight, because the nativity of our Lord took place at the corresponding hour in the following December. This we find exactly attended to by many of the old painters, and indicated either by the moon and stars in the sky, or by a taper or a lamp burning near. With regard to the locality, we are told by St. Luke that the angel Gabriel was sent from God, and that ' he came in to Mary' (Luke 1:28), which seems to express that she was within her house. In describing the actual scene of the interview between the angel and Mary, the legendary story of the Virgin adheres very closely to the scriptural text. But it also relates, that Mary went forth at evening to draw water from the fountain ; that she heard a voice which said, 'Hail, thou that art full of grace!' and thereupon, being troubled, she looked to the right and to the left, and, seeing no one, returned to her house, and sat down to her work. Had any exact attention been paid to oriental customs, Mary might have been working or reading or meditating on the roof of her house ; but this has not suggested itself in any instance that I can remember. We have, as the scene of the interview, an interior which is sometimes like an oratory, sometimes a portico with open arcades ; but more generally a bedroom. The poverty of Joseph and Mary, and their humble condition in life, are sometimes attended to, but not always ;for according to one tradition, the house at Nazareth was that which Mary had inherited from her parents, Joachim and Anna, who were people of substance. Hence, the painters had an excuse for making the chamber richly furnished, the portico sustained by marble pillars, or decorated with sculpture. In the German and Flemish pictures, the artist, true to the national characteristic of naive and literal illustration, gives us a German or a Gothic chamber, with a lattice window of small panes of glass, and a couch with pillows, or a comfortable four-post bedstead furnished with draperies, thus imparting to the whole scene an air of the most vivid homely reality. As for the accessories, the most usual, almost indispensable, is the pot of lilies, the symbolical Fleur de Marie. There is also a basket containing needlework and implements of female industry, as scissors, etc., not merely to express Mary's habitual industry, but because it is related that when she returned to her house, "she took the purple linen, and sat down to work it". The work-basket is therefore seldom omitted. Sometimes a distaff lies at her feet, as in Raphael's Annunciation. In old German pictures we have often a spinning-wheel. To these emblems of industry is often added a basket, or a dish, containing fruit; and near it a pitcher of water, to express the temperance of the blessed Virgin. There is grace and meaning in the introduction of birds, always emblems of the spiritual. Titian places a tame partridge at the feet of Mary, which expresses her tenderness ; but the introduction of a cat, as in Barroccio's picture, is insufferable. The Archangel Gabriel, "one of those who stand continually in the presence of God", having received his mission, descends to earth. In the very earliest representation of the Annunciation as an event, we have this descent of the winged spirit from on high; and I have seen other instances. There is a small and beautiful sketch by Garofalo, in which, from amidst a flood of light and a choir of celestial spirits, such as Milton describes as adoring the "divine sacrifice" proclaimed for sinful man, the archangel spreads his lucid wings, and seems just about to take his flight to Nazareth. He was accompanied, says the Italian legend, by a train of lower angels, anxious to behold and reverence their Queen; these remained, however, at the door, or "before the gate", while Gabriel entered. The old German masters are fond of representing him as entering by a door in the background; while the serene Virgin, seated in front, seems aware of his presence without seeing him. But, whether walking or flying, Gabriel bears, of course, the conventional angelic form, that of the human creature, winged, beautiful, and radiant with eternal youth, yet with a grave and serious mien. In the later pictures, the drapery given to the angel is offensively scanty; his sandals, and bare arms, and fluttering robe, too much d f antique; he comes in the attitude of a flying Mercury, or a dancer in a ballet. But in the early Italian pictures his dress is arranged with a kind of solemn propriety: it is that of an acolyte, white and full, and falling in large folds over his arms, and in general concealing his feet. In the German pictures, he often wears the priestly robe, richly embroidered, and clasped in front by a jewel. His ambrosial curls fall over this cope in ' hyacinthine flow.' The wings are essential, and never omitted. They are white or many-colored, eyed like the peacock's train, or bedropped with gold. He usually bears the lily in his hand, but not always. Sometimes it is the sceptre, the ancient attribute of a herald; and this has a scroll around it with the words ' Ave Maria gratia plena!' The sceptre or wand is occasionally surmounted by a cross. The olive-bough has a mystical sense wherever adopted; it is the symbol of peace on earth. Often the angel bears neither lily, nor sceptre, nor palm, nor olive. His hands are folded on his bosom; or, with one hand stretched forth, and the other pointing upwards, he declares his mission from on high. In the old Greek pictures, and in the most ancient Italian examples, the angel stands, as in this sketch after Cimabue , wherein the Greek model is very exactly followed. According to the Roman Catholic belief, Mary is Queen of heaven and of angels�the superior being; consequently, there is propriety in making the angel deliver his message kneeling: but even according to the Protestant belief the attitude would not be unbecoming, for the angel, having uttered his salutation, might well prostrate himself as witness of the transcending miracle, and beneath the overshadowing presence of the Holy Spirit. Now, as to the attitude and occupation of Mary at the moment the angel entered, authorities are not agreed. It is usual to exhibit her as kneeling in prayer, or reading with a large book open on a desk before her. St. Bernard says that she was studying the book of the prophet Isaiah, and as she recited the verse, ' Behold, a Virgin shall conceive and bear a son,' she thought within her heart, in her great humility, ' How blessed the woman of whom these words are written ! Would I might be but her handmaid to serve her, and allowed to kiss her feet! '�when, in the same instant, the wondrous vision burst upon her, and the holy prophecy was realized in herself. I think it is a manifest fault to disturb the sublime tenor of the scene by representing Mary as starting up in alarm; for, in the first place, she was accustomed, as we have seen, to the perpetual ministry of angels, who daily and hourly attended on her. It is, indeed, said that Mary was troubled; but it was not the presence, but the ' saying,' of the angel which troubled her�it was the question ' how this should be?' (Luke 1:29). The attitude, therefore, which some painters have given to her, as if she had started from her seat, not only in terror, but in indignation, is altogether misplaced. A signal instance is the statue of the Virgin by Mocchi in the choir of the cathedral at Orvieto, so grand in itself, and yet so offensive as a devotional figure. Misplaced is also, I think, the sort of timid shrinking surprise which is the expression in some pictures. The moment is much too awful, the expectance much too sublime, for any such human girlish emotions. If the painter intend to express the moment in which the angel appears and utters the salutation 'Hail!' then Mary may be standing, and her looks directed towards him, as in a fine majestic Annunciation of Andrea del Sarto. Standing was the antique attitude of prayer; so that if we suppose her to havebeen interrupted in her devotions, the attitude is still appropriate. But if that moment be chosen in which she expressed her submission to the divine will, ' Behold the handmaid of the Lord ; let it be unto me according to thy word!' then she might surely kneel with bowed head, and folded hands, and ' downcast eyes beneath th' almighty Dove.' No attitude could be too humble to express that response; and Dante has given us, as the most perfect illustration of the virtue of humility, the sentiment and attitude of Mary when submitting herself to the divine will. The presence of the Holy Spirit in the historical Annunciations is to be accounted for by the words of St. Luke, and the visible form of the Dove is conventional and authorized. In many pictures, the celestial Dove enters by the open casement. Sometimes it seems to brood immediately over the head of the Virgin; sometimes it hovers towards her bosom. As for the perpetual introduction of the emblem of the Padre Eterno, seen above the sky, under the usual half-figure of a kingly ancient man, surrounded by a glory of cherubim, and sending forth upon a beam of light the immaculate Dove, there is nothing to be said but the usual excuse for the mediaeval artists, that certainly there was no conscious irreverence. The old painters, great as they were in Art, lived in ignorant but zealous times�in times when faith was so fixed, so much a part of the life and soul, that it was not easily shocked or shaken ; as it was not founded in knowledge or reason, so nothing that startled the reason could impair it. Religion, which now speaks to us through words, then spoke to the people through visible forms universally accepted; and, in the Fine Arts, we accept such forms according to the feeling which then existed in men's minds, and which, in its sincerity, demands our respect, though now we might not, could not, tolerate the repetition. We must also remember that it was not in the ages of ignorance and faith that we find the grossest materialism in Art. It was in the learned, half-pagan sixteenth and the polished seventeenth century, that this materialized theology became most offensive. Of all the artists who have sinned in the Annunciation�and they are many�Nicolo Poussin is perhaps the worst. Yet he was a good, a pious man, as well as a learned and accomplished painter. All through the history of the art, the French show themselves as the most signal violators of good taste, and what they have invented a word for�bienseance. They are worse than the old Germans ; worse than the modern Spaniards �and that is saying much. In Raphael's Annunciation, Mary is seated in a reclining attitude, leaning against the side of her couch, and holding a book. The angel, whose attitude expresses a graceful empressement, kneels at some distance, holding the lily. Michael Angelo gives us a most majestic Virgin standing on the steps of a priedieu, and turning with hands upraised towards the angel, who appears to have entered by the open door ; his figure is most clumsy and material, and his attitude unmeaning and ungraceful. It is, I think, the only instance in which Michael Angelo has given wings to an angelic being; for here they could not be dispensed with. In a beautiful Annunciation by Johan van Eyck, the Virgin kneels at a desk with a book before her. She has long fair hair, and a noble intellectual brow. Gabriel, holding his sceptre, stands in the doorway. The Dove enters by the lattice. A bed is in the background, and in front a pot of lilies. In another Annunciation by Van Eyck, painted on the Ghent altarpiece, we have the mystic, not the historical representation, and a very beautiful effect is produced by clothing both the angel and Mary in robes of pure white. These few observations on the general arrangement of the theme, whether mystical or historical, will, I hope, assist the observer in discriminating for himself.